The Multiware Toolkit For Peachtree V2.1 is a powerful set of tools that gives you new and flexible means to exchange accounting data with your Peachtree™ Accounting software. This package takes advantage of the Peachtree COM/ActiveX interface to import and export accounting data. Works with Sage 50/Peachtree Complete or higher, versions 2019 , including Quantum. A standalone application that will scan your Peachtree backup for physical damage to any of your data files, giving you confidence that your backups are OK. The Excel workbook and Access database are powerful tools that you can use "out-of-the-box", letting you 1) immediately put the package to work, pulling your data into spreadsheets and customizable reports, and 2) see how to use the objects and methods supplied in the library. Note: the Excel and Access tools do not work with 64-bit Office. The Multiware MS Excel Tool is a comprehensive set of Excel worksheets contained in one Excel workbook file, MW_ExcelToolForPT.xls. From that workbook, you can view all of your primary accounting data. Each worksheet is formatted in a manner that produces an attractive printed output. 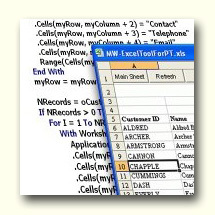 You don't need to know how to code in VBA to access your data or modify the worksheet formatting. However, if you are comfortable with VBA code, you can do even more. The Toolkit also includes the Multiware MS Access Tool; a powerful set of forms, reports, filters, and VBA code for accessing your accounting data. Through the Access Tool top-level dialog, you can choose to Export data, print reports, or Import data into your accounting database. More than 30 common report formats are provided as ready-to-use. Several import functions are provided as examples of VBA code you can use when creating your custom applications for channeling data into your accounting database. Price: $349 for initial license, $179 for each additional license. Licenses include one year of updates, and one hour of installation support including basic product instruction. More than 1 hour of database and/or programming support is billable. Once you have purchased your first copy of Toolkit you can purchase additional licenses by logging in and selecting Purchase Additional licenses from your product page. Click here to get An Introduction to the Toolkit. You will need to uninstall the Trial version & install the full version of the Toolkit to register. The order key will NOT work with the trial edition. If you are ready to purchase the full version select the Purchase button below.